Atria 340B (Formerly 340B Solutions Pharmacy Services) is the leading 340B provider for health centers and hospitals. To reflect their helm as innovate industry leaders and experts, they needed an out-of-the-box redesign to their website to stand apart from their competition and showcase the breadth of their services. 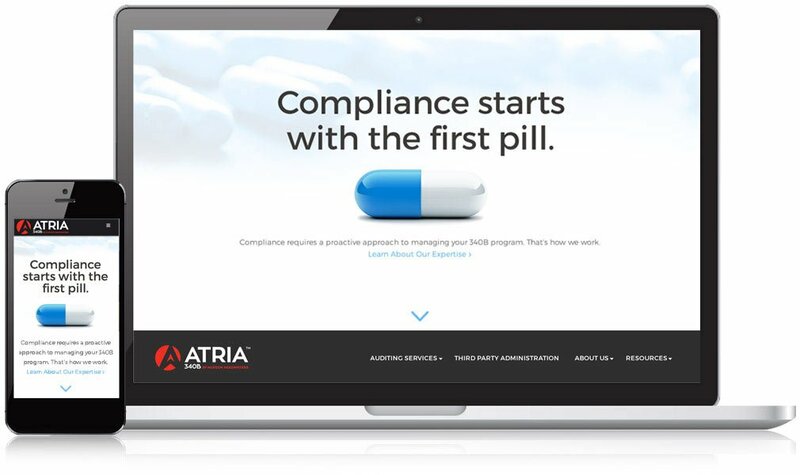 Atria 340B needed a modern and responsive design that showcased they were a leader as a Third Party Administrator of 340B contract pharmacy arrangements in the country. Unlike their previous site, Atria 340B’s new website design delivers a clear and concise sales pitch through its clean and dynamic design, showcase of services, and by building trust with website visitors. Atria 360’s custom website design was made to set them apart from their competition. The striking homepage focal point, unique layout, and dynamic calls-to-action make Atria 340B’s website stand out from your average run-of-the-mill website template. At Mannix Marketing, we believe the design of your website should say something your brand. Altria 340B’s brand is all about thinking outside-of-the-box to come up with unique solutions for their clients, and now their website design reflects that. In order to convert website visitors into sales leads, Atria 340B needed to make it clear what their services were and make it easy for visitors to contact them. Our expert programmers made this happen by displaying their services front and center and featuring a testimonial on the home page to help build trust with new visitors. The ‘Request Information form’ call-to-action towards the bottom of the page makes it easy for visitors to request additional information and reinforce the goal of getting website visitors to contact them. 340B Solutions’s new website makes them stand out from the crowd. Want your website to set your business apart?